This date is engraved in the timeline of my life. Ten years ago, I sat in a courtroom. My husband sat next to me. We sat for hours. I remember continually shifting our bodies in an effort to remain comfortable in the hard, wooden benches. I remember my husband putting his arm around me, resting his elbow on the top of the bench. And I remember exchanging glances with my husband as couple-after-couple presented their cases before the judge. The couples argued whether he would get the Porsche and the Lexus and she would get the vacation home. Just before lunch, the judge announced that she was finished listening to cases for the day. Our case had not yet been heard. Neither my husband nor I could swallow the thought of having to sit through another day of depressing court cases. We quickly shuffled to the front of the courtroom and kindly asked the judge if she would listen to our case. Ours was simple. Ours was amicable. We were in complete agreement. All we wanted was the court to grant our simple request. The judge reviewed the small stack of paperwork we presented. She praised us for our civility, she signed her name on the line, and she wished us well. With the judge's signature, my husband was now my ex-husband. I have been divorced for ten years now. TEN YEARS! There comes a time when you've been divorced for as long as you were married, and it seems as though the marriage becomes insignificant in your life history. But there also comes a time when you've been divorced for more than three times the length of your marriage. It's at that point in time when you feel like you were never married. 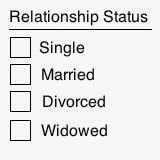 When I was first divorced, it was easy to check the "divorced" box when asked my relationship status. But if you ask my status today, I'll tell you I'm "single." Because that's what I consider myself to be. Over the years, I've questioned the institution of marriage, particularly with respect to my life. In retrospect, I married because that is what society told me I should do. I should fall in love, I should get a ring on my finger, and I should seal the deal with a wedding ceremony. And once that's done, I should get a job, buy a house, fill the house up with stuff, and start a family. Then again, over the years, I've questioned a lot of things in my life. And I've decided that a good deal of what society says I should do just doesn't make sense for me. Obviously something is broken with the institution of marriage. We're all well-versed in the statistics that half of marriages end in divorce. Of those who remain married, I would venture to guess that a good percentage of those couples would choose to divorce if they could, but they're not strong enough to do so. I am all for strong, committed, lasting relationships, whether you call it a marriage or not. But I am not at all for unhealthy relationships -- relationships where one or both partners do not feel that their relationships are allowing them to live their lives to their fullest potential. To me, the most powerful relationship is one bound by a mutual desire to want to remain together. It is one in which either partner could walk away at any time. But neither does, because both partners choose to be with one another. So, yes, technically I am divorced. But more importantly, I'm single. And I've been happily single for ten amazing years. June 30, 2004 is my "seared into memory" date. My divorce was very much like yours - uncontested, no kids, no bickering over property. We didn't even do it the courtroom, but in a little room off to the side of it, where we were asked a few questions, signed a form or two, each received a copy of the divorce decree and that was it. It couldn't have lasted even 10 minutes. I've been thinking a lot more lately, when confronted with the "relationship status box." I was only married for four years, so I've now been divorced for 150 percent longer than I was married. It seems that I should stop counting myself as divorced and revert back to single. Who would know or care or tell me I can't? Maybe I've hung onto my status as a divorced person because I was on the receiving end of the divorced and it was the only scrap of the marriage I had left. My husband has already remarried, bought a house and had two children. I still haven't even gone on a date since the divorce. Where am I even going with this? I guess my point was that, like you, my memories and the significance of having been married are growing dimmer as time passes, so it might be time to reorient the way I think about it. The fact that I didn't realize that my 10-year divorce milestone date had come and gone until four days later is probably a sign. I concur, it's time to reorient the way you think. In fact, that time sounds as though it is far overdue. It seems appropriate to initially label oneself as a divorcee, particularly in the immediate time following a divorce, when the divorce casts such a significant shadow on all that is meaningful. But with time, maturity, introspection, and experience, the significance of being labeled a divorcee should have faded. Let those things that have added color and spice to your life define who you are.